Some people say our memories are what make us. Others think it’s important to let go of the past and live in the present. Of late I’ve been telling friends I fear for our future. As technology gets smarter, in some ways the humans who create and use it are getting dumber. As I continue to spend time with today’s young people, mostly in school classrooms, I see how the digital world has transformed the way we learn, behave and interact. While I struggle to contemplate what the future might hold, I know my memories serve me purpose. They remind me of all the people I’ve crossed paths with and the lessons I’ve learnt, sometimes explicitly, but mostly just by being in their presence. On the weekend I was reminded how important it is to revisit our past and reflect on how events and interactions have shaped us for better or worse. Yesterday I spent hours creating a timeline of my life to test how far back my memory could go. I took mental note of the things I recalled which seem insignificant now, making me question why I’d remember them at all. It was like I’d stepped on a land mine surrounded by several hundreds, just waiting to be unearthed. As I remembered one instance, small details of another would trickle in without warning. One moment I’d be recreating the space of a friend’s lounge room, and the next, thinking about the fabric of teacher’s skirt from grade one. It has been months since my fingers have typed without requiring a pep talk and several coffees beforehand. But when I started to think about all the things I’ve seen, heard and smelt in this life, my fingers regained a life of their own and starting bouncing around uncontrollably. Within a few hours I’d scribed almost the same amount of words required of a recently submitted university assignment; only that took me over six months and carried hours of mental self-torture and warm tears. I think it’s the freedom of knowing I can write about my memories without having anyone tell me they are incorrect or not good enough to publish. Although some memories brought back feelings of disappointment and terror, I noticed myself smiling as I contemplated how they’ve served me into the future. I think sharing memories is good for the maker, as well as the audience who pays attention. I find comfort from thinking about all the things I have achieved and overcome during my 27 (almost 28) years of life on Earth. I think stories of the past carry powerful messages which others can learn from, even if that just means helping them to unearth their own memories that bring pleasure or work through pain. I know that when I listen to people share intimate stories about themselves, it riles up emotions in me based on past experiences which have damaged and grown me. On Saturday I sat listening to a new friend share a very personal story about how she overcame challenges created in her mind; her story caused my skin to tingle, my heart to warm and my admiration towards her to grow. It reminded me that everyone has lived a truly unique life and we all have stories within us others could learn from. In saying that, I plan to share some of mine over the coming weeks that will hopefully entertain, inspire and humour you. 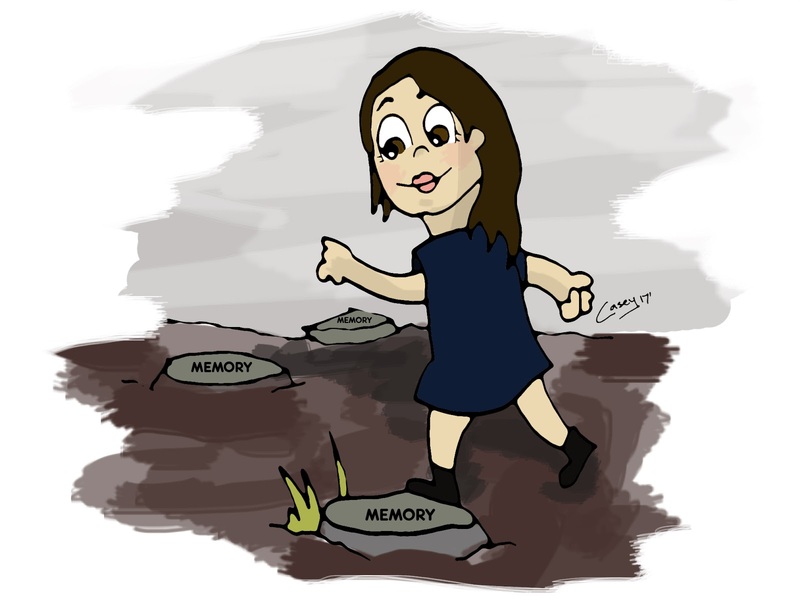 I have so many stories I want to share, some of great relevance to who I am now, and others which for some reason or another, have risen from the unsettled muck in my hippocampus AKA part of the brain responsible for long-term memory. I haven’t decided just how intimate I want to get, given my audience ranges from family members, to students I teach, to committed Tinder users (stalkers/future husband?). Although, what I do know, is we should be sharing more stories which highlight the humanistic traits we tend to keep private in fear of judgement and criticism. I think it’s important for young people to gain access to stories of failure and vulnerability, to disrupt the stream of “success stories” in their Facebook news feed. So, friends, family and randoms like the aggressive renter who called me a c**t for not getting his TV antenna fixed on time to watch the AFL grand final—take care and keep your eyes on this space. With only a few stories in the “for when I’m dead or achieved care-factor zero” pile, most are being recouped and sorted in preparation for posting. In the meantime, I’d be interested to know whether you think the stories need to be in chronological order or can be a mish-mash of events presented however I see fit.